Itâ€™s a great honor to introduce the latest creation by cooperative game master, Matt Leacock. There are so many things we love about this unique game: from the rich illustrations, to the collaborative nature of play, to the innovative set of rules, to the infinite possibilities generated by the tiles and cards. Donâ€™t be surprised if your pulse starts pounding faster soon after you start playing â€“ itâ€™s a game that instantly generates an electrifying atmosphere of tension and excitement! Very much like Pandemic, but with a stronger theme (IMHO). Also, with a modular set-up, you can always have a different game board each time you play. One of the top cooperative games to own! Forbidden Island has been a hit with friends and family who've played with us. 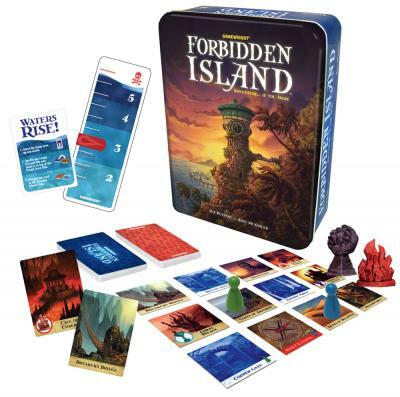 The theme (collect treasures and escape before the island sinks) and a fast-playing cooperative gaming experience are appealing -- you either win or lose together. From the same game designer (Matt Leacock) as the award-winning Pandemic. Many of the same mechanisms but simplified so that children or light gamers can enjoy. And for those who like to game, it makes a nice, inexpensive filler game. Great co-op game with beautiful artwork. I love that it plays in less than an hour and is simple enough to let my children participate. Forbidden Island is one of the best "gateway games" I've played so far. It's for 2-4 players and plays in 30 minutes or less. It's a co-operative game so everyone stays involved and you win as a team or lose as a team. It's from the designer that made Pandemic and borrows some ideas from it. This game has varying levels of difficulty and can be enjoyed by a "gamer" or the youngsters. Beautiful artwork and not intimidating. Enjoy! I've heard the phrase "Pandemic Lite" attributed to Forbidden Island, and that's quite what it is. This isn't a BAD thing, and the game does play out differently due to the random board, differing goals, and differing individual player powers... I just wouldn't recommend owning both games. The game is more straightforward, easier to teach, and plays in 30 minutes for those who prefer their cooperative games to be more of an opener or filler. Great co-op game. You and your teammates go around a modular board game (so no 2 games are ever the same) trying to get the 4 elemental treasures. The Catch: the island is slowly disappearing beneath the waves. Card matching, cooperative play, and luck are needed to win this game. Very challenging to players of all ages! A must-get! You've read the comparison to Pandemic and having owned that game first I would say there is a need for both in your collection. Forbidden Island has a great theme and is a bit easier to teach and set up. I enjoy this when I am more in the mood for a laid back game but have an itch for a co-op game. Feels like pandemic (same creator), but is still different enough to be a lot of fun. Also great for younger players as a gateway.